You can send 1 "Edge Imp" monster from your hand to the Graveyard; inflict 800 damage to your opponent. 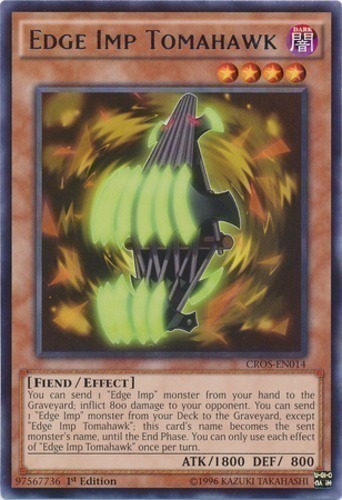 You can send 1 "Edge Imp" monster from your Deck to the Graveyard, except "Edge Imp Tomahawk"; this card's name becomes the sent monster's name, until the End Phase. You can only use each effect of "Edge Imp Tomahawk" once per turn.